Kosher Info: There are two frum Indian vegetarian restaurants (not specifically kosher certified), where I ate most of the time. Both are in the old town. One is called Balti Drambliai at 41 Vilniaus Street. Very tasty, very cheap, diverse menu, great environment, my favorite place hands down. The other is called Vegafe on 2 Augustijonu Street – more limited options and pricier – not as good as the first place, but if you're there more than a couple days and want to mix it up, this is a good option. There's also a Chabad in the old town that offers boxed meals which is the only certified kosher food in town for €15 (Euros) per meal. The website says they can deliver the meals to your hotel but they didn't offer this service when I was there. They also can host you for Shabbos meals and all that, though I didn't try this out. According to the Chabad website, the local Maxima supermarket includes a very small, basic Kosher section, and is located at: Mindaugo Street 6. Travel Info: There's a Vilna Gaon Jewish State Museum in Vilnius which is dedicated to the historical and cultural heritage of Lithuanian Jewry, located at Naugarduko gatvė 10. 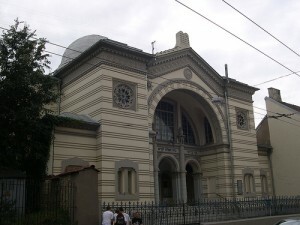 Chabad also assists with your travel planning and guided tours of the city. Jewish Info: Vilnius has an active shul on 37 Pylimo, next to the old town and walking distance from most hotels. It's got shacharis and mincha/maariv daily. The community is very small and on the older side now. They have a rabbi there half the time and he'll have you for simple shabbos meals, if he's in- they're not vegetarian friendly meals. Image Credit: Flickr user "upyernoz"